Mary, Mary, quite contrary, how does your garden grow? Meet the new residents of my balcony. 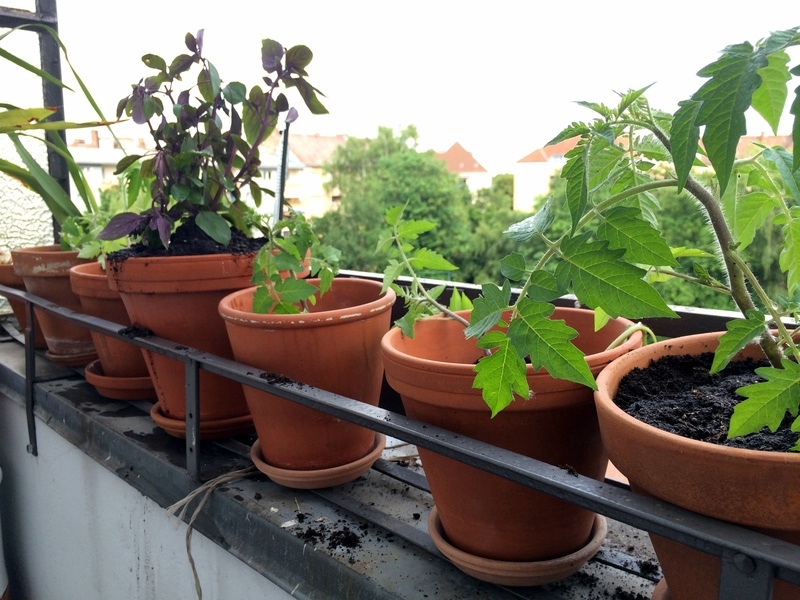 After asking for advice on the very first day I arrived, I finally got around to started growing some plants on my balcony in Berlin. I'm thinking about starting a little garden on my balcony, what should I grow? Herbs? Tomatoes? I'm inexperienced so hardy is good. Over the years I've tried to grow little things, but I haven't had much luck, living in city apartments without much sun... which is why having a balcony is so exciting. My mother's the green thumb in the family, who can somehow even coax the pit of an avocado into a really healthy plant. I got five little tomato plants from a woman named Anna on the Reflect-Info mailing list. This email list, in addition to posting calls to action for protests and counter-protests (against neo-Nazi and right-wing groups), sublets, and lefty event announcements, also has people giving away and looking for random things like moving boxes, refrigerators, and bicycles. Anna told me grew the plants from seeds that she collected from a tomato plant growing in the Tempelhof park, which the residents of Berlin just voted a little over a week ago to keep as public open space (instead of a somewhat vaguely formulated plan by the city government to sell the land to developers for market-rate and possibly some undetermined amount of below-market-rate housing). The bigger plant in the middle is Strauchbasilikum, which is some sort of basil... though I can't seem to figure out what the English name would be. I bought it at the nursery just off of Mauerpark where I also got some potting soil. The tag says it's good for fish and meat, though the recipe for marinade on there is a little vague: "Marinate meat overnight in a mixture of oil, garlic, and some herbs." But let's not get ahead of ourselves, it needs to grow first!